My Uncle Mel was a great American. As a barber, he cut my hair. As a soldier, he was a corporal in the U.S. Army, a recipient of a Purple Heart. And now, a Congressional Gold Medal winner. I couldn’t make it to DC for the big Congressional Gold Medal event this week. I’ll be in the area next week to do my one-man show and just couldn’t get there early. 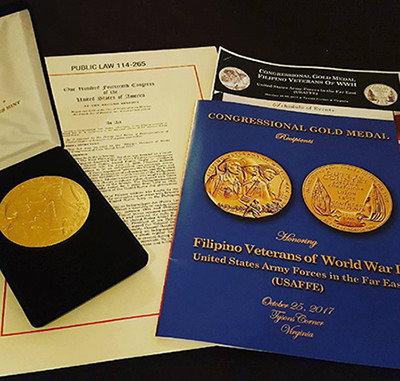 So like many of you, I saw it on maybe the one good thing that House Speaker Paul Ryan has ever done: provided a video stream of the Congressional Gold Medal ceremony for the Filipino Veterans of WW II. 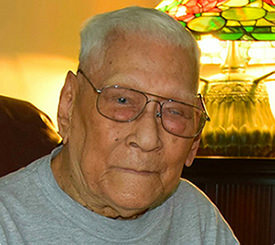 The other rich moment came with the initial recognition of Almeda, and the realization that this 100-year-old vet had outlived it all: World War II; the post-war politics of the Rescission Act of 1946 that took away promised benefits to Filipino vets; and every last one of his Congressional detractors–and there were many–who time and again denied Almeda and his fellow vets their just due. A bit of contrition was in order. Sen. Charles Schumer summoned up what little he could and extended it to the veterans. It was painful to watch the ceremony, and not just because it was more than a half-hour before any Filipino American spoke. I’ve talked to him now a number of times over the years and know he feels badly that he never saw combat. “I did not even pinch the ear of a Japanese solider,” he told me with a bit of regret when I saw him in his home last summer and asked about what he did during the war. He told me he spent most of his time in the service unloading ships with food, supplies, and tanks for the front lines. As other soldiers died on the battlefield or passed on, Almeda was one, who with others led by Eric Lachica of the American Coalition of Filipino Veterans and the son of a veteran, were on the front lines in the equity pay battle. As I watched the video of Wednesday’s ceremony, I couldn’t help think of that moment and all the moments of protest Almeda went through in just the last few years. On my Facebook page, Dr. Allan Bergano was disturbed. “After 75 years, that comes to $200 a year…less than $1 a day,” he wrote. Dawn Mabalon, who was at the ceremony, chimed in on my FB page, upset that it was a token amount but appreciative too for the recognition. “As far as I’m concerned, it’s not over until we get the history straight so that all Americans understand who we are and what we have done in the making and shaping of today’s America,” she wrote. Mabalon, fittingly, is an American history professor at San Francisco State. She’s also a friend. But I was closer to her father, Ernesto T. Mabalon, who died in 2005 at age 80. It was Mabalon and the guerrillas who kept the U.S. informed with intel during the Japanese occupation of the Philippines. In part with that help, MacArthur returned to Leyte, which led to victory in the Pacific. But Dawn Mabalon knows her dad didn’t do any of it for a medal. Filipinos who still aren’t sure if their family member qualifies for a replica medal should go to www.filvetrep.org for more information. 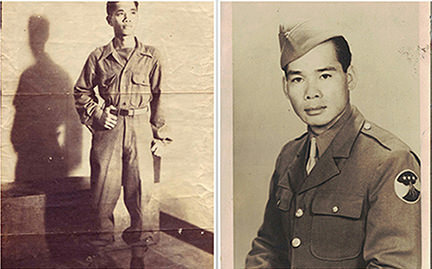 The Filipino WWII vets now join a long list of fighters who faced discrimination even in valor. The list includes the Tuskeegee Airmen, the 442nd of Nisei veterans, the Navajo Code Talkers, and the all-Hispanic 65th Infantry Regiment of the Korean War, all of which have been honored with the Congressional Gold Medal. Only the Filipino vets had to fight to restore the legitimacy of their service. But how’s this for irony of ironies. The Filipino vets got their medal and stand among fellow honorees like Gen. Douglas MacArthur, who led most of the vets to victory. And then there was awardee President Harry S. Truman, who signed the Rescission Act of 1946 taking away benefits from the Filipino vets. THE AFTER PARTY: FILVET PROM? By all accounts, people continued the party at the Ritz Carlton in Virginia. Dawn Mabalon was at the ceremony with unique qualifications. Her family represents the closeness between the Filipinos and the military. Her father was one of the 240,000 who answered President Franklin Roosevelt’s call to serve and was a USAFFE member attached to the Army. Add to that her maternal grandfather, Delfin, who also fought in WWII but was one of the 20,000 Filipino Americans in the U.S. during the war who enlisted to prove loyalty to their new country. For many Filipinos, that was the best route to the American middle class. The path went from American colonial who couldn’t own property, to a spot in the military, to GI Bill recipient. Service to America was the affirmative action where you put your body on the line. And it was the difference for many families. So it was great to see friends and family post their pictures on the web to capture the joy of their veteran getting the heralded Congressional Gold Medal. My Uncle Mel was represented by his son-in-law, Lt. General Ed Soriano. It was a great honor for my cousins and the entire Guillermo family. But it’s just one night after 70 years. Like old soldiers, the night’s memory will fade away. It won’t take away the pain of denial and the scars of a bitter fight waged against Congress, which was happy to play the attrition game–counting on veterans dying–before being forced to take action. Congress deserves no medal for that. Not even its own. See Emil’s “Amok Monologues: All Pucked Up,” a one-man show on Filipino American History, and more at Baltimore’s Charm City Festival.